– Deontay Wilder defeats Berman Stiverne to win the WBC Heavyweight title, the first American world Heavyweight champion since 2007. We break down the fight and assess the future for “The Bronze Bomber”. Is Wilder the future of the Heavyweight division. And oh yeah, Dudu Brown goes in on Wilder, letting all her feelings known about him! – Leo Santa Cruz made fairly easy work of Jesus Ruiz. We discuss the future for Cruz, and why he needs to step it up in 2015. – Amir Imam’s exciting stoppage over Fidel Maldando Jr. How good is Imam and could he become a future world champ? – Negotiations have broken down for a potential clash between Miguel Cotto and Saul “Canelo” Alvarez. – The continuing saga that is Mayweather vs. Pacquiao. – Al Haymon’s new Boxing series on SpikeTV. – Julio Cesar Chavez says he’s returning to the ring in April, and Bob Arum trying to block it. It’s been a while since I’ve done a weekly wrap so here’s another one for ya. I know I’m late with this week wrap up (I blame my constant issues with procrastination plus being recently hit with a head cold), but given what went down this past week I had to write about it. As we all know, the big fight this past week was the highly anticipated and much talked about Heavyweight showdown between WBC Heavyweight champion Bermane Stiverne and the heavily hyped and much questioned no. 1 contender Deontay Wilder that took place last Saturday at the MGM Grand in Las Vegas that had questions abounds, mainly regarding Wilder. Did Wilder answer those questions or did he flop? Well, let’s get into all that went down. 1. 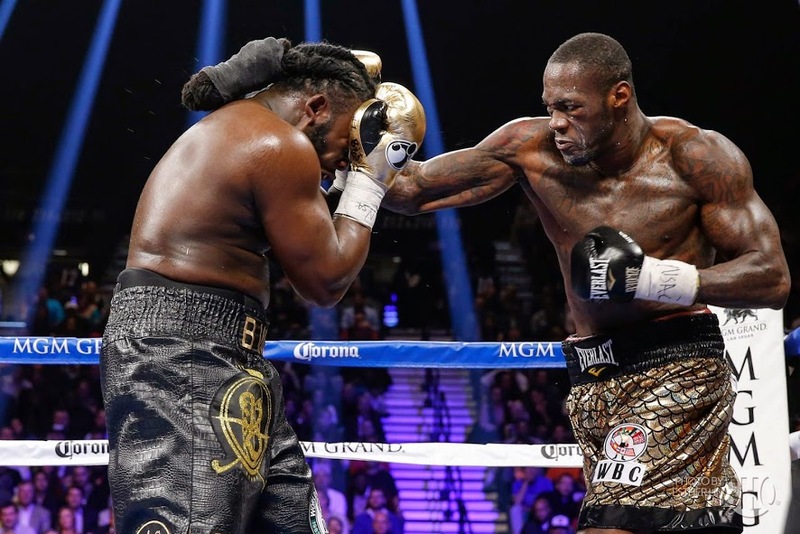 Deontay Wilder Shows He’s the Goods – Going into his bout against defending WBC Heavyweight champ Bermane Stiverne, the spotlight was fully on Wilder. With a glossy record, but limited resume entering this bout, there were many questions surround Wilder (33-0, 32 KOs). Had Wilder fought the type of competition to prepare himself for a bout against the tough and hardened Stiverne (24-2-1, 21 KOs)? Is his power really that legit? Does he have the stamina to last the distance given he’s the most rounds he’s fought so far was four rounds? And most importantly, what happens when he gets hit by the hard-punching Stiverne, can he take a shot or will he crumble? Well by the end of the fight, Wilder answered all the critics and skeptics as he out-boxed and out-fought Stiverne to become the new WBC Heavyweight champion, defeating Stiverne by a hard-fought unanimous decision in a tension filled and exciting contest. The key to this fight is that Wilder was simply able to do more and had more creativity in terms of his attack. 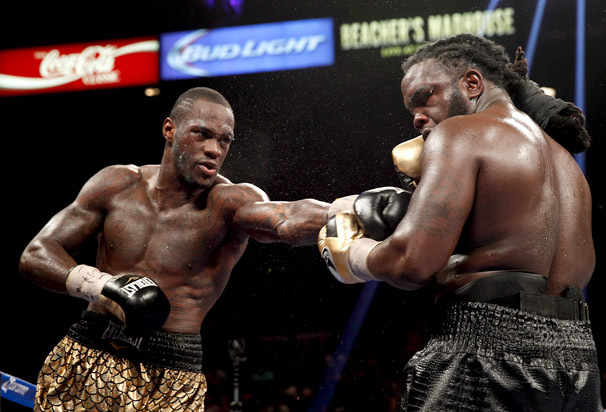 Wilder’s jab was terrific all night long and he used his excellent movement and range to keep Stiverne at a distance. Stiverne on the other hand had trouble cutting off the ring and was rather simplistic in his attack. Wilder stunned Stiverne several times during the bout, but to his credit Stiverne showed tremendous toughness and grit taking the punishment and fighting back hard. However, Wilder showed himself to be the superior fighter and his win has invigorated the Heavyweight division. The first American world Heavyweight champion since Shannon Briggs in 2007, Wilder has not only the style, but also the personality to be a potential star. Could a Wilder – Wladimir Klistschko fight happen down the line. Let’s hope so! 2. Leo Santa Cruz Wins, but Leaves a Lot To Be Desired – Fought on the undercard of Stiverne – Wilder, Santa Cruz (29-0-1, 17 KOs) did what he was supposed to do, beating Jesus Ruiz before stopping him in eight rounds to defend his WBC Super Bantamweight title. Ruiz fought hard for the first couple of rounds, but the defending champion slowly broke down Ruiz (32-6-5, 21 KOs), punishing him with body shots before eventually finishing him off. In spite of this fairly dominant win what was really accomplished here? This was another defense by Santa Cruz against an opponent he was clearly better than and not really in his league. The question is now for Santa Cruz, when will he fight some of the big dawgs in either the Jr. Featherweight or Featherweight division. Santa Cruz had called out Jr. Featherweight kingpin Guillermo Rigondeaux as well as former champion Abner Mares. So far those fights as well as potential showdowns against the likes of fellow Jr. Featherweight titlist Carl Frampton or Scott Quigg have yet to occur. Hopefully a big fight and true test for Leo Santa Cruz will happen later on this year. 3. Amir Imam and Fidel Maldanado Jr. Put On the Fight of the Night!!! – The talk before this bout was about Imam and how good he has looked heading into this bout in what seemed to be a showcase bout against Maldanado. By the end of this fight, the fans at the MGM Grand was what an exciting and wild fight this was. Imam (16-0, 14 KOs), a tall and rangy Jr. Welter with power is one of the better young prospects in the sport. Already talking about fighting for a world title, Imam was expected to handle Maldanado Jr (19-3, 16 KOs) fairly easy. Well, the bout didn’t exactly turn out that way. On the same card as Stiverne – Wilder, Imam got off to a good start knocking down Maldanado down with a right hand towards the end of round two. However, things took a dramatic turn in round three. Seconds into the round Maldanado hurt and dropped Imam by way of a left hook, stunning the crown. To his credit Imam dusted himself off and proceeded to knock Maldanado courtesy of a right hand. Another shot by Imam again knocked down Maldanado. Both fighters let the punched fly throughout the round and had the crowd on its feet. Round three is the early leading candidate for round of the year. From round four on, Imam gained control as his talent showed to be the difference. After controlling the fourth round, Imam finished things off in round five hammering Maldanado before referee Robert Byrd called things to a halt at the end of the fifth. A terrific, action packed fight and both fighters brought it. Entering this past week of boxing, we were asking a whole of questions. At the end of the week there were a whole lot of questions answered. Deservedly so, this week and this moment in boxing belongs to Deontay Wilder who showed that he is a fighter of substance and now has folks buzzing about his potential. Wilder is the not only a world champion, but a fighter that could grasps the attention of American fight fans as well as mainstream sports fans. Not too long ago the question was, where was the next emerging American Heavyweight. Well that fighter is here, he’s known as “The Bronze Bomber”, and his name is Deontay Wilder.